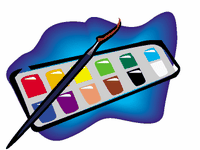 There are lots of childrens art projects that involve the use of paint. While everyone knows you can paint with your fingers or a brush, adding "a little twist" makes it more fun for the kids. Try one of the ideas listed below for a whole new painting experience. This is a great children's art project for all those old markers that most people just throw away. Using large sheets of paper, dip the markers in water for a fun way to watercolor. When the markers are used up the tips will turn white. Using plain white paper, give the children paintbrushes to paint with water covering the entire piece of paper. While the paper is still wet, let them use markers to draw a picture. The colors will blur and look fuzzy for an interesting picture. Use flour, salt and water in equal amounts. Use liquid paint for color. Put the mixture into squeeze bottles. Let the children dribble pictures or designs on heavy paper. Let dry completely. You will need: powdered tempera paint and clear dish washing liquid. Mix the powdered paint with the dish washing liquid until it resembles the consistency of house paint. Make sure to tape the window sills with masking tape, and spread newspaper on the floor under the window. Use an assortment of different size brushes to create the window pictures. While the paint is still wet, a dry towel will remove any mistakes. *Try this childrens art project to decorate windows during holidays. Let children paint on foil using several colors of paint. When they are done, lay a piece of paper over their creation, pressing firm but not hard to make neat looking prints. For this easy childrens art project you’ll need: One cup flour, one cup water and 1 ½ teaspoons salt. Mix the ingredients together to create a textured finger-paint that sparkles when it dries. Use plastic forks dipped in various colors of paint to create lines across large sheets of paper. *Other painting tools can also create interesting effects. Try cotton swabs, old toothbrushes, sponges or yarn. Wrap yarn in interesting patterns around small blocks of wood. Have the children dip the blocks into paint and press on paper. Help them to vary the angle the block is placed at and use several colors per picture. Place a drop or two of paint on a large sheet of white paper. Let the children use straws to blow the paint around the paper. Use several different colors. *Because some children will “blow with all their might”, you might want to plan this as an outdoor activity. Paint smocks are also a good idea. Lay a piece of paper in an old 9 x 13 inch cake pan. Dip a ball (super, golf, tennis, ping-pong) into poster paint, set on the paper, and let the children tip the cake pan. *Marbles work too for this childrens art project, but watch younger children carefully! Use powdered tempera paint mixed with salt in salt shakers to create pictures. Have the children spread or dribble glue on a piece of paper. Shake the paint/salt mixture over the glue. Wait until the glue dries and then shake off the excess paint for an interesting effect. This childrens art project can be quite messy and is best done outside. Use large sheets of paper. Dip the bristles of a toothbrush into paint. Hold the bristles downward, and flick them with a craft stick. This creates a dazzling splatter painting if several colors are used. *As an alternative, cover the papers with stencils of the child’s name prior to painting. Remove stencils when dry. Have the children put pieces of masking tape on finger paint paper in any design. Then let them paint over the paper and the tape with watercolors. Let dry completely, and carefully remove the tape. This will create an interesting design with white lines. Smooth flat stones are easier to paint, but any rocks will do. Make sure the rocks are clean and dry. Use a wide variety of paint colors and encourage the children to be creative. Squiggles and wide lines look nice. Let the rocks dry completely and use them to decorate a walkway or garden. *Washable paint cannot be used or the rain will wash it away. Give children two primary colors of finger paints. This is a great way to learn that red and yellow make orange, blue and red make purple, etc. Place newsprint paper onto a flat surface and tape down securely. Mix several colors of tempera paint and let the children carefully dribble bits of paint onto the paper. While the paint is still wet, place a layer of cling wrap over the entire piece of paper and smooth it down. Carefully remove the cling wrap, and let dry completely before using. Put a small amount of paint in a paper cup, and let the children “glop” it on a sheet of paper. They can tilt the paper to spread the paint. When the paint is dry, have them look carefully at the picture. What does it look like? Could it be a house, a boat, a bug? Give them markers or colored pencils to complete the picture. Mix three tablespoons sugar and ½ cup cornstarch in a saucepan over low heat. Add two cups cold water and stir until the mixture thickens. Remove from heat, and divide into 4-6 separate paper cups. Add a few drips of different colored food coloring into each cup along with a drop or two of dish soap. Stir each cup and let them cool. Fold a sheet of construction paper in half. Open and place a few splotches of paint on one side of the paper. Fold the paper over and let the children press down on the paper. Open to see what was created. Does it look like a bug, a plane, a toy? Use a variety of foods and several colors of paint. Slice a potato, carrot, apple, onion or green pepper in half lengthwise. Dip in shallow paint and stamp on white paper. Place a small amount of liquid starch in a Ziploc sandwich bag. Add a little tempera paint. Seal the bag and squish to mix. Children can then use their fingers to draw designs on the bag.